Georges Seurat (1859-1891) worked on this his most famous painting for two years. No wonder. It’s ten feet long and consists of dots of paint the size of a pin head. Much of the avant-guard art at the time concerned itself with ocular issues: the interaction of color, optical illusions involving color, retinal aftereffects of various colors. Artists were radical in their use of color, certainly, but there’s more here than an experiment in color theory. These artists lived in late 19th century Paris and its civilization was not free of discontents. Drawing from life and street scenes, artists contemplated social stratification and its incongruities. 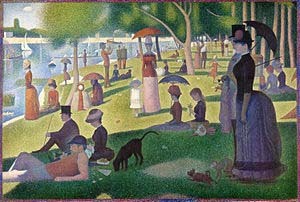 The people in “La Grande Jatte” appear to be isolated, insular in their assigned societal roles. It’s a sunny Sunday afternoon, everybody is out enjoying some rest and leisure , but somehow this image manages to be uncomfortable. The main character, the woman at the right, appears to be collaged onto the canvas. She and her sliver of a companion occupy a dominant part of the canvas. Seurat lets us know that she is a prostitute. He conveys this information by drawing her with a monkey on a leash, a common prop for prostitutes at that time to attract clientele. The colors are lovely and we are entranced by the mind-boggling detail of the tip-of-the-brush work. When we flip the canvas left-right, it becomes apparent how tormented the social situation is. When the prostitute is on the left, we empathize with her and that’s asking too much of us. She has to be on the right to show how alien and isolated she is. This, in a society where everybody had double standards for women and wives knew what brothels their husbands frequented. But the prostitute was still marginal, a thorn in the side of bourgeois culture, and here she is, the main attraction in this huge, in-your-retina painting. The flipped version of the painting is painful to look at because we feel the character’s isolation all the more and because now the shore line goes down and therefore there’s no hope at all. 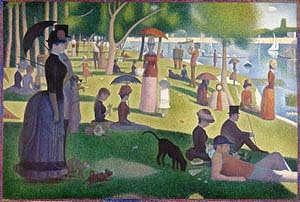 Other paintings by Seurat also draw the shore line going from upper left to lower right, and with good reason. Later.